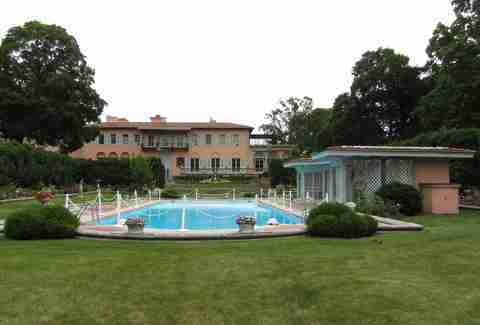 Remember all those '80s movies where some ungrateful adolescent lives in an incredible mansion-esque estate? 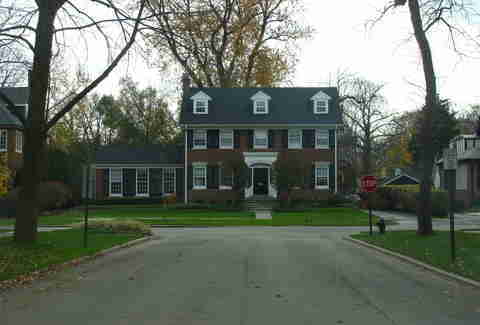 Chances are good that house exists somewhere in the Chicago 'burbs. While a big part of this is thanks to our intrepid chronicler John Hughes, plenty of other directors have seen Chicagoland as a perfect stand-in for the platonic America of their dreams. While not every great Chicago movie home is actually from around here (it's heart-breaking that the Griswold family home from Christmas Vacation was built on an LA lot), there are still plenty of beautiful and memorable movie homes sitting in our own backyard. Just be on the lookout for the Wet Bandits. 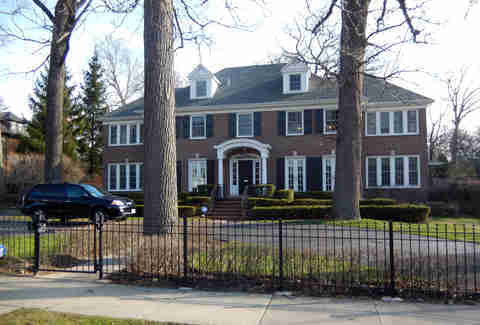 The all-time king of Chicago movie homes was the fantasy residence of children born between 1980 and 1988. If you were a kid when Home Alone swept the nation in 1990 it’s guaranteed you spent at least one day setting elaborate traps around your house for your parents, dog, or whoever was unlucky enough to try and use the laundry room, all the time dreaming you were in the McCallister’s amazing Georgian revival mansion. 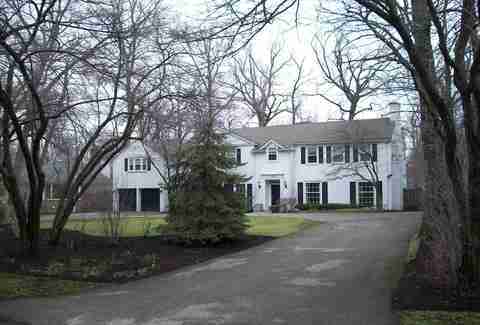 Depicted by John Hughes, as many of the homes on list were, as the quintessential idyllic suburban residence, the 4,200sqft home was built in 1920 sold recently for just over $1.5 million. That’s a lot of cheese pizzas. Another picture of suburban heaven courtesy of John Hughes. One of the many revival style homes that popped up all over the north shore before World War II (the house was built in 1931) it serves as the backdrop for Molly Ringwald’s character Samantha as she struggles with her family during the lead up to her sister’s wedding. The house is not only home to Samantha’s huge third floor bedroom, the perfect '80s angsty teen retreat, but was also the setting for the films iconic final scene, where Samantha and her crush Jake share their birthday cake kiss in front of the home’s large picture windows. Although the house has been expanded since the filming, it still maintains the homey American charm that made it the ideal setting for Hughes’ teenage musings. While most Chicago movie homes have served as the location of teen drama and middle-American family hijinks, this Gold Coast home was used to slightly more sinister effect. The modernist home of Harrison Ford’s Dr. Richard Kimble found its way into the movie after Ford had dinner with the home’s owner, Polish doctor Norbert Gleicher, and fell in love with the house. It was the site of the murder that sets off the movie when the”one-armed man” kills Kimble’s wife. The house is one of the most unique in the city, with a loft inspired design that keeps it open and airy despite its four floors and 6,000sqft size. Despite how stunning it is, it has been on and off the market for years, but it is once again for sale for a cool $3.5 million. Although the famous groundhog festival takes place in Punxsutawney every year, Harold Ramis choose Woodstock, Illinois as a stand in for the rural Pennsylvania town because of its more, let’s say “presentable” appearance. Called the Cherry Street Inn in the movie this classic Victorian home epitomizes the small town charms of the fake Punxsutawney where Bill Murray finds himself repeating the same day over and over. It’s frankly a little hard to understand how Murray’s Phil Connors took so long to fall in love with the town after staying in this beautiful historic building. The house was a private residence at the time of filming but the owners eventually took inspiration from the film and converted the eight-bedroom building into a bed and breakfast which it is still operating as today. In 30 years since it’s release Ferris Bueller’s Day Off has slowly grown in stature to become the quintessential Chicago movie. That’s not an accident as John Hughes deliberately used the joy-ride nature of the story to capture the look and spirit of the city. 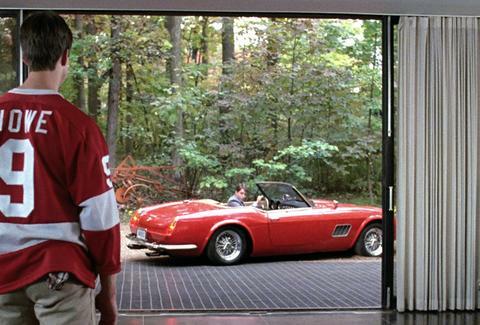 Despite many memorable locations, like the visit to the Art Institute, the one people usually remember best is Cameron’s glass garage where he trashes his father’s prized Ferrari. The building is not just a garage but a “pavilion” with a bedroom and kitchen, separate from the main house. Both structures use a similar minimalist design to emphasize the beauty of the wooded lot in Highland Park. 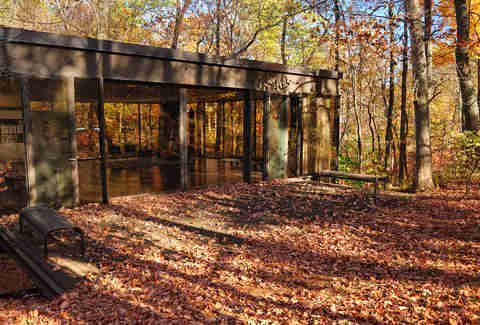 The house itself dates back to 1953 and was designed by A. James Speyer, a student of Chicago modernist scion Mies van der Rohe, and the pavilion was added in 1974 by a student of his. Quite the architectural legacy. Say what you will about Cameron’s dad, the man has good taste. Even in his more cynical moments John Hughes usually painted his North Shore settings in an affectionate light. Paul Brickman did not go this route for Risky Business, which instead digs into the darker underside of American materialism and ambition. The perfect Highland Park home used for the movie eventually descends into depravity as Joel Goodson transforms it into a brothel to pay back the destruction of his father’s Porsche (what was it with '80s dads and classic cars?). Joel’s descent into a shameless businessman to fix his parents' perfect possessions in a not-so-subtle dig at the morals of affluent suburbia in Reagan's America. The house itself takes center stage in the final scenes as Joel races to refill it with the stolen furniture. While the other homes on this list were usually put forward as an ideal, this one was used as a potent reminder of what often lies behind pleasant facades. 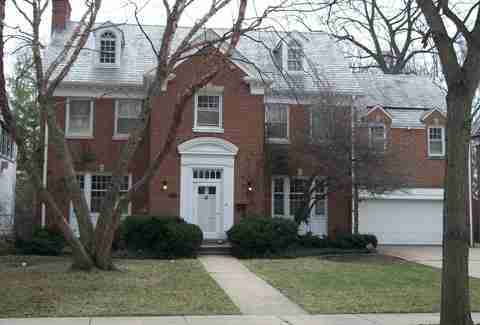 Unlike many other houses on this list the Page residence in Planes, Trains and Automobiles is rarely seen, mainly in sideways flashes to the family that is waiting for Steve Martin to finally make it home. But in that sense it is used possibly more effectively, and deliberately, than anything else on this list. The Chicago North Shore was the '80s idea of a utopia, the perfect life that Neal Page has and John Candy’s Del Griffith secretly wishes he did. The red brick Georgian house itself is as stock-photo perfect as you can find and could stand in for any wealthy suburb in America. The affection for the characters extends to the home itself, a warm inviting retreat that makes you understand why someone would fight so hard to get back. Not a bad place to spend the holidays. Robert Redford’s best picture winner is complex meditation on a family falling apart with a suburban Chicago backdrop. Released in 1979 the movie was one of the first to portray the Chicago suburbs as the picturesque standard of American life. While the house in Risky Business hid some shady dealings the one in Ordinary People shows how the trappings of a seemingly perfect life won’t help to hold a family together after tragedy. In particular Mary Tyler Moore’s Beth Jarrett shows that the outward stability projected by wealthy families can often be a veneer for real suffering, to the point where they are unable to handle any disruption in the dream life they have built. Their large, beautiful, but quite empty house an excellent symbol of the occasional cost of living the American dream. Poor Julia Roberts, in the end she (SPOLIERS!) doesn’t get the guy and must instead return to her job as a food critic in New York, which must be very difficult for her. Luckily she gets to enjoy a wedding reception at the beautiful Cuneo Mansion and Gardens in Vernon Hills. 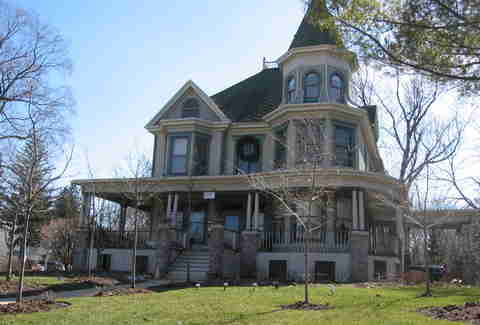 The house itself looks so out of place you wouldn’t be blamed for thinking it wasn’t filmed in Chicago. That’s because the historic mansion was built in the Italianate style for Samuel Insull, an original founder of General Electric, during a time when people didn’t mind plopping down a Mediterranean mansion in the middle of Lake County. Still it hard to deny that it is a beautiful building and the ideal setting for a lavish wedding. 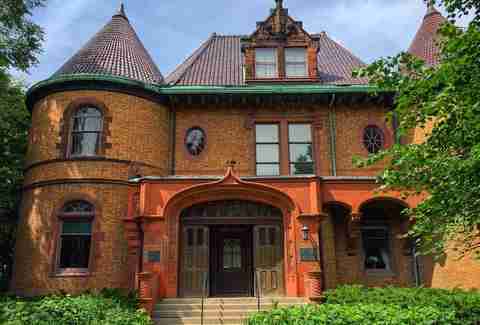 If you are interested in taking a looking inside keep an eye out, the mansion was donated to Loyola University in 2009 along with its extensive historic art collection, and they occasionally open it up for self-guided tours. If Sam Mendes’ 2002 crime drama tells you one thing about Chicago in the '20s, it’s that the city's criminals had a pretty sweet life. Especially so for Irish mob boss John Rooney who gets to live it up in the stately Charles Dawes house while his son goes around murdering everyone in sight. The Dawes house was built during the height of French architecture craze in the late 19th century, which inspired many of the most famous mansions of people like the Vanderbilts, and is named for former Vice President and Nobel Peace Prize winner Charles G. Dawes, its owner for almost 50 years. 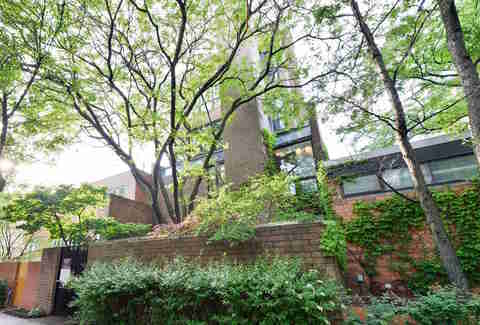 It’s designer, H. Edwards Ficken, gave the more modest Dawes house a more unique rustic vibe and the Evanston jewel went on to become a national historic landmark in 1976. 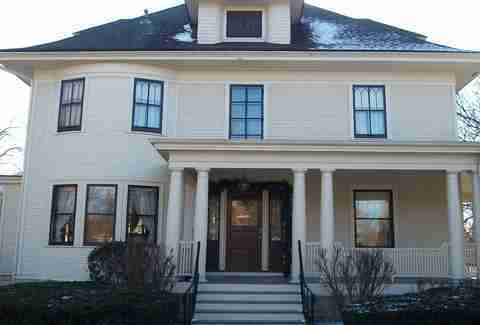 Since 1960 it has been home to the Evanston History Center, which offers guided tours. Who wouldn’t want to be part of a family with Bill Pullman and Peter Gallagher? Who would ever believe Sandra Bullock would be hopelessly lonely and working for the frickin’ CTA? These are just some of the questions proposed in this '90s rom-com, but it is hard to deny the charm of both Bullock and and the Callaghan family, and it is hard to deny they have a pretty nice house. Once again suburban Chicago steps in as the place where every lonely, beautiful ticket taker or tollbooth attendant would dream of settling down. Although the house is not quite as impressive as some of the other homes here, which is not to say it isn’t its own little picture of suburban bliss, this time it also comes with the perfect family living inside. Who wouldn’t pretend to be the fiancé of a stranger in a coma to get a piece of that?